[L.] Ar´tium Baccalau´reus (Bachelor of Arts). One of the four major blood groups in the ABO system. Individuals with this blood group have both A and B antigens on the surface of their red blood cells, and no antibodies for A and B in their blood serum. An abdominal muscle: Sit-ups help strengthen the abs. 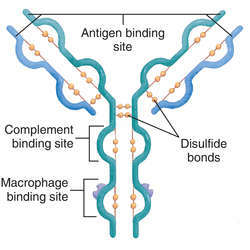 The part of an antigen that interacts with an MHC molecule. prep beforehand; a notice given previously or a condition existing earlier. antibody. Called also gamma globulin (γ). See immunoglobulin. Q. is it possible to change my blood type from ab to ab-? and immunologically there shouldn't be a problem, because the body will react to an addition of proteins but not the lack of them (Rh-). but i fail to see why you want to do that.